This document describes how to troubleshoot Cilium in different deployment modes. It focuses on a full deployment of Cilium within a datacenter or public cloud. If you are just looking for a simple way to experiment, we highly recommend trying out the Getting Started Guides instead. This guide assumes that you have read the Concepts which explains all the components and concepts. We use GitHub issues to maintain a list of Cilium Frequently Asked Questions (FAQ). You can also check there to see if your question(s) is already addressed. If Cilium encounters a problem that it cannot recover from, it will automatically report the failure state via cilium status which is regularly queried by the Kubernetes liveness probe to automatically restart Cilium pods. If a Cilium pod is in state CrashLoopBackoff then this indicates a permanent failure scenario. Cilium allows to rule out network fabric related issues when troubleshooting connectivity issues by providing reliable health and latency probes between all cluster nodes and between a simulated workload running on each node. By default when Cilium is run, it launches instances of cilium-health in the background to determine overall connectivity status of the cluster. This tool periodically runs bidirectional traffic across multiple paths through the cluster and through each node using different protocols to determine the health status of each path and protocol. At any point in time, cilium-health may be queried for the connectivity status of the last probe. For each node, the connectivity will be displayed for each protocol and path, both to the node itself and to an endpoint on that node. The latency specified is a snapshot at the last time a probe was run, which is typically once per minute. The ICMP connectivity row represents Layer 3 connectivity to the networking stack, while the HTTP connectivity row represents connection to an instance of the cilium-health agent running on the host or as an endpoint. The above indicates that a packet to endpoint ID 25729 has been dropped due to violation of the Layer 3 policy. The pod is running in host networking and will use the host’s IP address directly. Such pods have full network connectivity but Cilium will not provide security policy enforcement for such pods. The pod was started before Cilium was deployed. Cilium only manages pods that have been deployed after Cilium itself was started. Cilium will not provide security policy enforcement for such pods. If pod networking is not managed by Cilium. Ingress and egress policy rules selecting the respective pods will not be applied. See the section Network Policy for more details. See section Troubleshooting for details and examples on how to use the policy tracing feature. There are always multiple ways to approach a problem. Cilium can provide the rendering of the aggregate policy provided to it, leaving you to simply compare with what you expect the policy to actually be rather than search (and potentially overlook) every policy. At the expense of reading a very large dump of an endpoint, this is often a faster path to discovering errant policy requests in the Kubernetes API. This is the standard Kubernetes control loop pattern. Cilium is the controller here, and it is iteratively working to bring the status in line with the spec. Opening the status, we can drill down through policy.realized.l4. Do your ingress and egress rules match what you expect? If not, the reference to the errant rules can be found in the derived-from-rules node. The cluster-diagnosis tool can help identify the most commonly encountered issues in Cilium deployments. The tool currently supports Kubernetes and Minikube clusters only. The tool performs various checks and provides hints to fix specific issues that it has identified. kubectl should be pointing to your cluster before running the tool. Endpoint to endpoint communication on a single node succeeds but communication fails between endpoints across multiple nodes. Run cilium-health status on the node of the source and destination endpoint. It should describe the connectivity from that node to other nodes in the cluster, and to a simulated endpoint on each other node. Identify points in the cluster that cannot talk to each other. If the command does not describe the status of the other node, there may be an issue with the KV-Store. Run cilium monitor on the node of the source and destination endpoint. Look for packet drops. Run cilium bpf tunnel list and verify that each Cilium node is aware of the other nodes in the cluster. If not, check the logfile for errors. If nodes are being populated correctly, run tcpdump -n -i cilium_vxlan on each node to verify whether cross node traffic is being forwarded correctly between nodes. verify that the node IP listed in cilium bpf tunnel list can reach each other. verify that the firewall on each node allows UDP port 8472. Run ip route or check your cloud provider router and verify that you have routes installed to route the endpoint prefix between all nodes. Verify that the firewall on each node permits to route the endpoint IPs. Lists all Kubernetes pods in the cluster for which Cilium does not provide networking. This includes pods running in host-networking mode and pods that were started before Cilium was deployed. Before you report a problem, make sure to retrieve the necessary information from your cluster before the failure state is lost. Cilium provides a script to automatically grab logs and retrieve debug information from all Cilium pods in the cluster. The cilium-bugtool captures potentially useful information about your environment for debugging. The tool is meant to be used for debugging a single Cilium agent node. 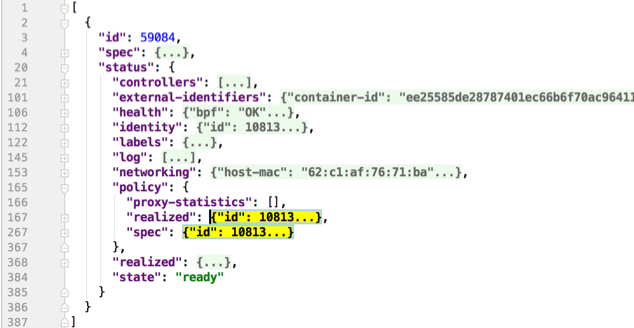 In the Kubernetes case, if you have multiple Cilium pods, the tool can retrieve debugging information from all of them. The tool works by archiving a collection of command output and files from several places. By default, it writes to the tmp directory. Note that the command needs to be run from inside the Cilium pod/container. When running it with no option as shown above, it will try to copy various files and execute some commands. If kubectl is detected, it will search for Cilium pods. The default label being k8s-app=cilium, but this and the namespace can be changed via k8s-namespace and k8s-label respectively. If you’d prefer to browse the dump, there is a HTTP flag. Please check the archive for sensitive information and strip it away before sharing it with us. Below is an approximate list of the kind of information in the archive. If you are not running Kubernetes, you can use the cilium debuginfo command to retrieve useful debugging information. If you are running Kubernetes, this command is automatically run as part of the system dump. Please check the debuginfo file for sensitive information and strip it away before sharing it with us. The Cilium slack community is helpful first point of assistance to get help troubleshooting a problem or to discuss options on how to address a problem. The slack community is open to everyone. You can request an invite email by visiting Slack. If you believe to have found an issue in Cilium, please report a GitHub issue and make sure to attach a system dump as described above to ensure that developers have the best chance to reproduce the issue. © Copyright 2017-2019, Cilium Authors. Revision 9cfd5303.